Now my intention was to give this to my husband to wear but after seeing how good the bracelet looked I decided to keep it for myself. After putting it on I have to say it fit my wrist perfectly and snug and looked good as well. 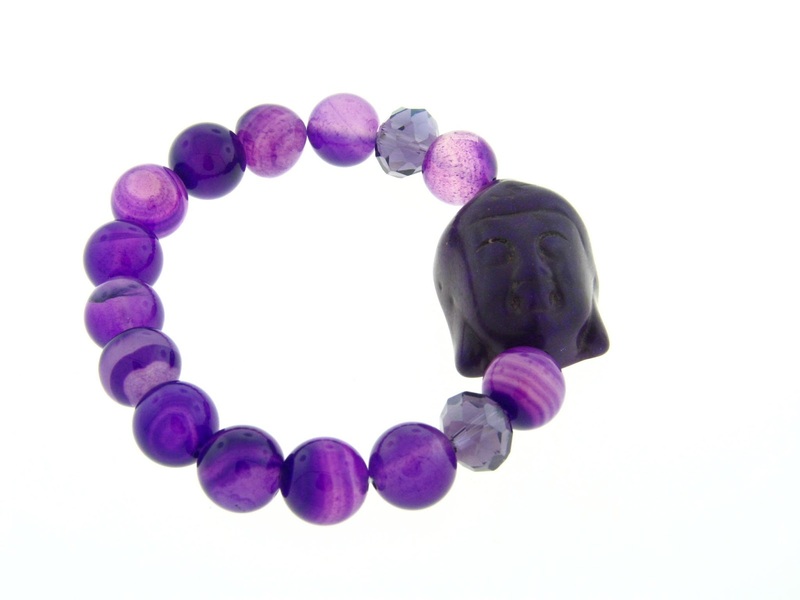 I really liked the coloration of the amethyst beads, combined with amethyst Swarovski crystals and the Buddha head was an eye catcher. Just looking at the bracelet I am reminded to keep calm, breathe deep and meditate. The quality of the bracelet is very good. The face of the Buddha is nicely detailed and shaped. Especially within the engravings on the face of the Buddha. I looked up the bracelet on their website and found out it sells for $29.99. I found this to be a little too expensive for this item. I would recommend that they drop the price by $5 dollars or so. But then again this bracelet as well as all of their other pieces on their website are very unique. Overall I find this to be a very nice bracelet and would recommend it to my readers. Please feel free to check out their website www.vangalz.com to see many of the other great pieces of jewelry they sell.